For fun, adventure and a chance to learn on the natural world, why not take your kids to an animal zoo? An animal zoo is a collection of animals from all over the world, often including rare or endangered species, gathered in one place for people to observe. Zoos have been around since biblical times and the first zoological garden to open in New Zealand was the Wellington Zoo which opened in 1906. A great activity for children to get in touch with nature and wild animals they have never seen and maybe even learn new words!<br /><br /> Watch this video and understand how educational and fun it can be for you and your kids! In addition to these kids' activities, the whole family can benefit from the opportunity to discover jungle animals and exotic creatures they might not have previously seen, except on television. 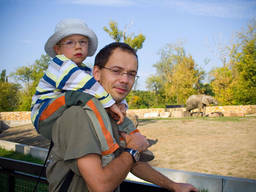 An animal zoo is likely to appeal to kids and adults of all ages. Some small children can get bored after a while so it is a good idea to vary your activities and allow plenty of opportunity to rest. Zoos usually have cafes and restaurants as well as a souvenir shop. Most major zoos also provide picnic facilities so you can bring your own food and enjoy lunch in a beautiful setting at your own pace. An animal zoo usually opens all year round, although some enclosures may be closed at certain times of the year for breeding or maintenance purposes. If there is a specific exhibit you want to see, it is a good idea to check to see if it will be open before setting off. Animal zoo admission is usually around $20 for an adult day pass and $10 for children but family discounts and season tickets are available and can offer substantial savings. Get there early during school holidays and on weekends as entry queues can be long. Before you go it is a good idea to look up the times of the keeper talks so you can plan your day. Make sure you get a map once you are inside so you don't get lost. Wear comfortable shoes and take a hat and sunscreen and plenty of water if it's hot.